Hi friends! I just got back from a fantastic trip to Mexico City! We went a few days early to celebrate our 10 year anniversary and then I taught for two days at Artescrap! Here are the two layouts we made and there's also a mini album I'll share a bit later! Trim off the barcode strips from all 24 patterned papers. Trace a butterfly onto another patterned paper or scratch cardstock, cut it out, then cover it with adhesive. Starting in the center, place a paper strip across the middle and continue placing paper strips above and below, just barely overlapping, until the entire butterfly is covered, then trim off the extra paper strips. On a patterned paper background, use the butterfly as a stencil to lightly trace it then paint over the traced butterfly with white paint. Splatter watercolors on top and let it dry. 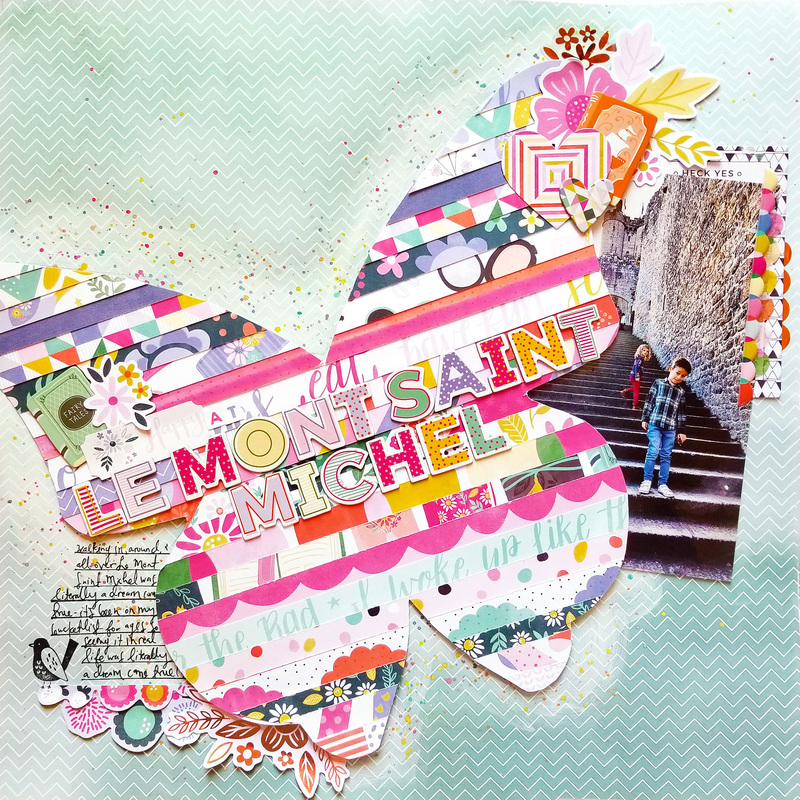 Stamp journaling lines on the bottom left side then add the paper strips butterfly over the painted butterfly using dimensional adhesive. Tuck a photo under the right side. Layer die cuts, washi tape, and puffy stickers under and around the photo. 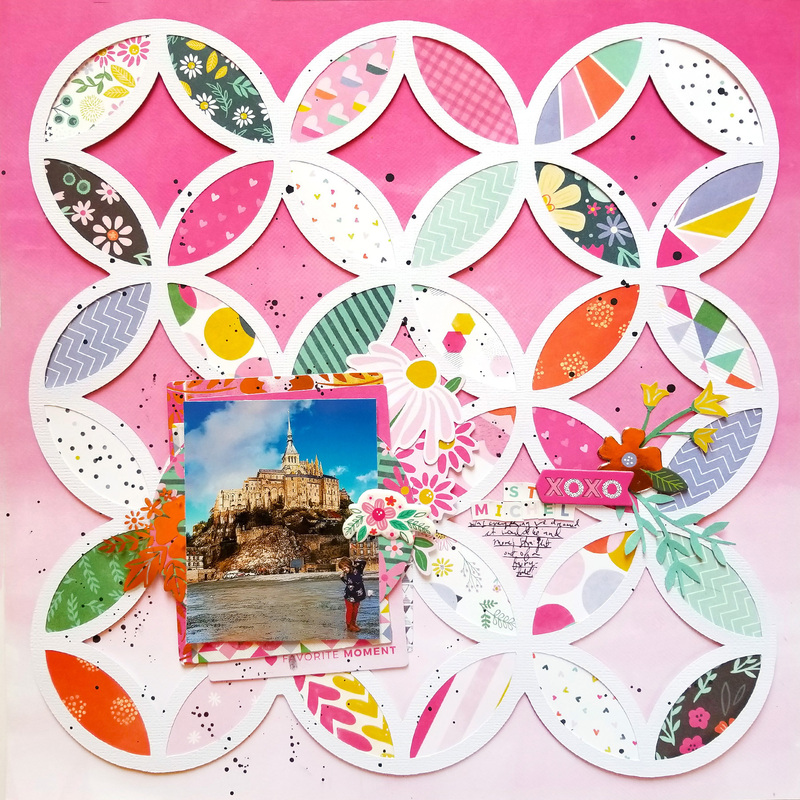 Create an embellishment cluster on the top right and bottom left. Make the title across the center of the butterfly using Thickers and embellish on the top left. Stamp a bird and write journaling on the journaling lines. Trace one inside petal of the die cut background onto scratch paper then cut it out just slightly bigger to use as a template. Trim Paper 10 into individual patterned squares, fold them in half, trace the petal, then cut the petals out. Spray the backside of the background die cut with adhesive the quickly place the petals – add the backed die cut background onto pink ombre paper using dimensional adhesive. Splatter black watercolors over the background. Layer a photo over die cuts and chipboard stickers then place it on the bottom left side. Fussy cut stems and flowers from Paper 06 and adhere them along with a mini alphabet sticker title and chipboard stickers on the right. Journal below the title. Love love love love these!! The colors are gorgeous and LOVING that butterfly on the first one!! Can't wait to hear about Mexico!!!!!!!!!!!!!!!! Both are stunning! Love the cutfile. Your papers are perfect for both layouts.....thank you! what a great use for barcodes from 12 x 12 papers. so many shapes you can use.